This book is a quiet revolution, a guide filled with practical advice to help you curb your obsessions and build boundaries between your work, your job, and your life. 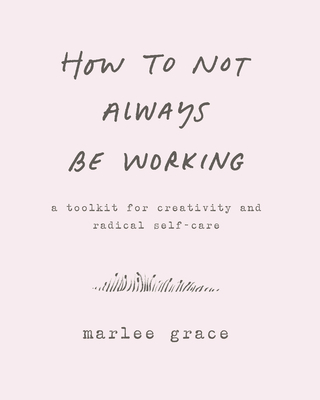 From business anecdotes about fulfilling orders to more personal stories about Marlee Grace’s recovery from divorce and addiction, this book is full of wisdom and resilience, with plenty of discussion about ritual and routine as ways to create effective and positive creative life change. In her workshops on healing and creative process, Grace helps people acknowledge their blocks and address them by setting distinct parameters that change their behavior. Now, she brings her methods and ideas to the wider world, offering all of us concrete ways to break free from our devices and focus on what’s really important—our own aliveness. Part workbook, part advice manual, part love letter, How to Not Always Be Working ventures into the space where phone meets life, helping readers to define their work—what they do out of sense of purpose; their job—what they do to make money; and their breaks—what they do to recharge, and to feel connected to themselves and the people who matter to them. Grace addresses complex issues such as what to do if your work and your job are connected, provides insights to help you figure out how much is too much, and offers suggestions for making the best use of your time. Essential for everyone who feels overwhelmed and anxious about our hyper-connected world—whether you’re a corporate lawyer, a student, a sales person, or a yoga instructor—How to Not Always Be Working includes practical suggestions and thoughtful musings that prompt you to honestly examine your behavior—how you burn yourself out and why you’re doing it. A creative manifesto for living better, it shows you how to carve sacred space in your life. Marlee Grace is an improviser and writer living on the rural coast of California. She works with improvisation as a method for navigating being alive and making work through movement, quilting, writing, and podcasting. Marlee also runs a community space and public studio in Inverness, CA called CENTER.